TZone SE. Photo provided by PBI-Gordon. Delivering twice the triclopyr per acre as most combination products, TZone™ SE Broadleaf Herbicide for Tough Weeds is the fastest triclopyr combination product on the market. TZone SE controls more than 60 of the toughest broadleaf weeds, including wild violet, ground ivy, henbit, oxalis, clover, and spurge. TZone SE even provides suppression of yellow nutsedge. Labeled for use on golf course fairways and roughs, and on residential and commercial properties, the reduced-solvent ester formulation of TZone SE can be used in a variety of turfgrasses, including Kentucky and annual bluegrass, and listed fescues and ryegrasses. 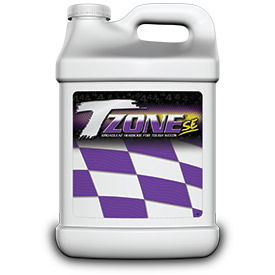 TZone SE is ideal for application in April and May, before applications of Surge® or Q4 Plus. For more information visit PBIGordonTurf.com.